Although we offer several different operating system images and CDROMs at the UpCloud control panel, you might want to install an operating system from your own installation media. This process requires you to create a storage that contains the install image, define it as a CDROM at the control panel and then boot up the server from that CDROM storage. Note that only most Unix-based operating systems are currently supported. When logged in, check that you have the storage space required to continue with the command underneath. Download the installation image you wish to use to the server, for example using curl and wait for the download to finish. When you have the desired image saved on the server, copy the file contents to the empty storage device with the following command. Check that the image name and the target disk are set correctly and that the image is copied directly. This operation is quite fast and when the image file has been copied to the storage, shut down the server either from your UpCloud control panel or with the command below. Once the server has powered down, go to your the overview tab in your server settings and scroll to the bottom of the page. Open the Optionals by clicking the text, then select cdrom as the first boot device and click the Save changes button. 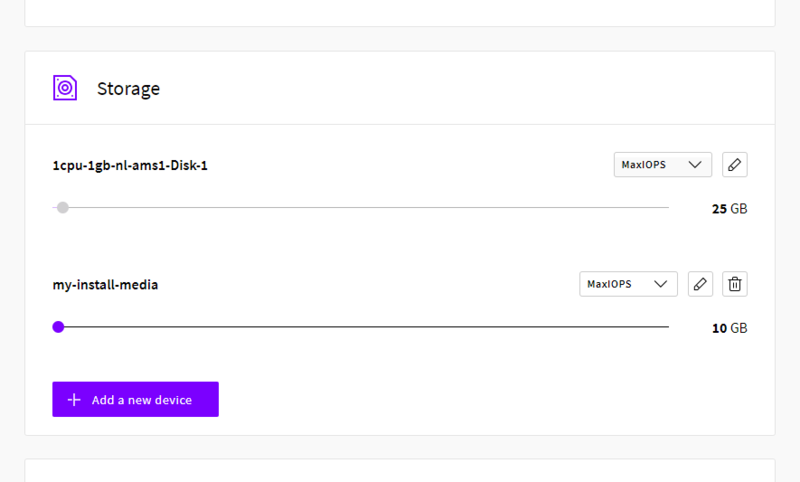 Next, go to the Resize tab in your server settings and check the second disk device you set up with the install media. Change the storage device controller to CDROM and click the Save changes button. This will tell the server to boot up from the media disk so that you may start the installation. You can now start the server again and go through the installation process with the disk image you downloaded. 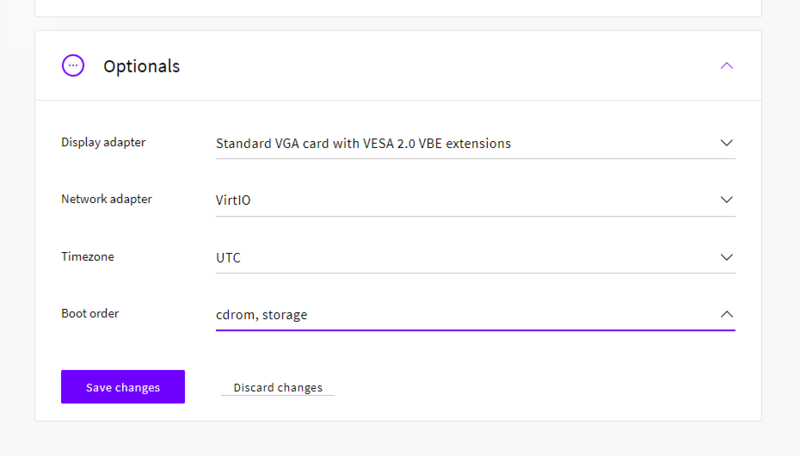 You will need to use either the web console at your server settings or a VNC connection to access the server during the installation. You can find more information about how to use these methods in our guide for connecting to your server. When you have finished installing the new operating system, shut down the server again and detach or delete the installation device from the Storage list. You may also wish to create a template of the newly installed server at the Storage list.